Shop Sabian SBR 18 Inch Crash/Ride Cymbal from AMS and enjoy Fast & Free Shipping. Ideal for beginners, the Sabian 18" SBr Crash Ride is a dual-purpose model that delivers full-bodied riding and loud crashing equally well. 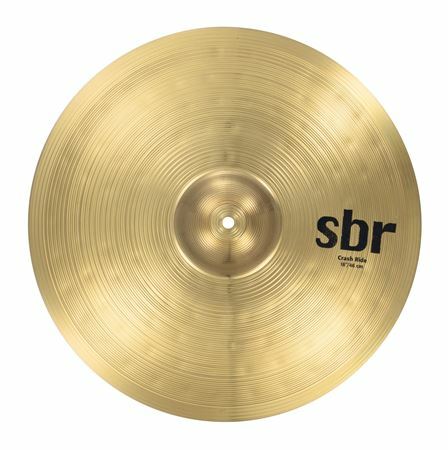 With hammered and lathed surface, tightly focused sound and nice price, SBr is in a class of its own. The old saying, "You get what you pay for"! Well that old saying hasn't been around as long without a reason. The name Sabian has been around for a long time as well and for good reason. You do get what you pay for and I am one happy camper with not only the name but the product associated with the name. I was putting together a set of drums for my Grand Kids to start learning on. Its not the greatest kit but throw on the right heads, tune it up, then start shopping for cymbals. Cymbals that not only sound good but are known to last. I already had a couple decent crash, wanted a decent crash/ride to go along. Chose the Sabian 18" Crash/ride here from American Musical. Very happy with my choice and am happy to be able to give my Grand Children some insight in to sound and value. Of course Paw Paw is giving the lessons and get I to sit down and play and listen as well. So glad I chose this one as I know it will stand the test of time! Like I said in the title, No Brainer! Well worth the money. Exactly what was needed. I love it. I hoped that It came with the tool that holds the cymbal in place. I now have to go and find one.